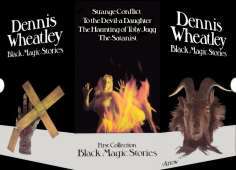 Boxed Set – contains: Strange Conflict (9/74), To The Devil—A Daughter (6/74), The Haunting Of Toby Jugg (6/74), The Satanist (6/74). Price £1.95. Boxed Set – contains: The Ka Of Gifford Hillary (6/74), Gateway To Hell (6/74), The Devil Rides Out (6/74), They Used Dark Forces (6/74). Price £1.90.